It’s only been just over 3 months since I originally wrote about Command Center. You can check out the original write-up here. Long story short, nothing has changed except I feel the thesis is slightly derisked after a decent Q2. Since mid-2016 the organization has been focused on right-sizing operations and the results are showing. The company now trades at a market cap of 21.3 mil with 4.1 mil in net cash. They have bought back some stock and are looking at potential acquisitions. I estimate ttm FCF at just over 3 mil. Though the shares responded well to Q2 earnings, they are only back to where they traded in April of this year. I believe that CCNI is a buy at this price. Disclosure: the author is long CCNI at time of writing. Quick update on what is a low risk high uncertainty stock in the portfolio. Q2 2017 numbers came out and were a little better than last year. The outlook provided was murky at best. Given how lumpy the transactional revenues are, it’s too be expected. And very recently the company announced the largest transactional licensing sale in history at 29.5mil. This is a pretty big deal given that revenue for the previous 12 months was 15.4 mil. on the news the company was up about 7.5% which equates to around 11 million in market cap. 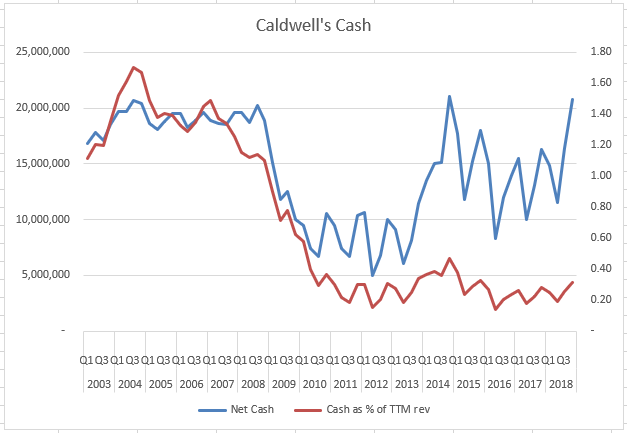 If you use the historical FCF margin for this business of 65%, the deal likely added closer to 20 mil in cash to the balance sheet. Given how much hype there is around electric vehicles, I’m not sure there has ever been so much negativity around oil and gas production. At least not since the great recession. Disclosure: the author is long PSD.to at time of writing. I picked up some shares of High Arctic Energy Services post Q1 earnings and after the AGM. I like the risk/reward of this company given where I think we are in the cycle. The company has a strong position in PNG and recent acquisition in Canada should ensure that earnings stay at least flat through the cycle. Concord Well Servicing (came over with the Tervita assets acquisition) has a large fleet in the WCSB and the stabilization in oil should bring stronger utilization throughout 2017. I believe there are other opportunities in Canada to pick up some assets on the cheap. Hopefully we will see more in 2017. Management is conservative with leverage and has done a good job of taking advantage of the downturn. Another nice tidbit is the board is going to limit the total dilution potential via stock options to management. The proposal passed at the AGM but 15-20% of shares voted against the option, DSU and RSU plan. The author is long HWO.to at time of writing. I have a few companies in the portfolio that deserve more of my attention. CVT.to is one of them. I originally bought CVT.to (see here) at the start of 2012 with a sum-of-the-parts valuation being the a major driver to unlock hidden value. There were a few others (EV/S, EV/EBIT, and P/B) that I compared the larger division (energy) to its competitors. My thinking was that the company would get rid of the CVT (continuously variable transmission) division and what was left would trade at a higher valuation as a stand-alone entity. Maybe the author deserves (some) credit as the company did sell the CVT division less that a year later. And for slightly more than I had though it was worth. However, I remain divided on what to do with my shares. Even though my original catalyst did happen, it didn’t drive share prices higher like I had thought. There has been a colorful history at CVT.to related to a now former board member (Aubert), the board, and executive management. The former board member initiated a proxy fight in 2013. It was then that the public was made aware that there was a offer for the company at $1.90 at the end of 2011. It was that bid that initiated the strategic review of the company that resulted in the eventual sale of the CVT division. Some may be asking why I still hold shares. This is a question I have been asking myself and hopefully have an answer to in short order. When the sale of the CVT division happened, the energy division was showing renewed signs of life posting annualized EBITDA of over $24 million or $0.33/share on a share price of $1.10 and pro-forma EV of $1.75/share. Giving a valuation of just over 5.25 EV/EBITDA. Given that it seemed like revenue would grow moderately organically and with some strategic acquisitions, I felt it worthwhile to hang onto my shares. Fast forward 2-3 quarters and revenue has been flat and margins have been hammered. Some have been from what could be one-time items (recent q has many costs from a project in the financials, but not all the revenue) and others are obviously execution. As for normalized earnings…my best guess would be to take average margins and just paste that onto the current revenue base with some annual additions from acquisitions. I don’t think the nature of the business has changed dramatically and the future looks similar to the past regarding the need to upgrade and maintain our electrical infrastructure. 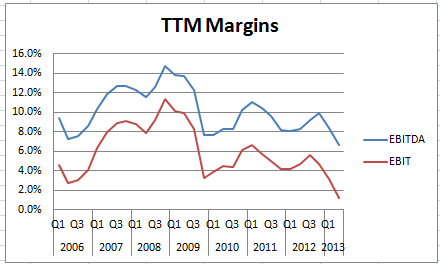 Taking the historical data (even with the CVT division muddying the waters) you could use a 10% EBITDA margin. Which would bring EBITDA to $0.37/share and give you about 4.5 EV/EBITDA. Cheaper than peers and cheap enough for the portfolio at the moment. Now that my original catalyst has been removed I have been looking at current management with a little more scrutiny to try and understand if they can execute on their business plan and increase shareholder value. My current concern is that management is not equipped to compete in the marketplace against it’s larger competitors in the United States. From what I have been monitoring, CVT.to is really the only company that has had it’s margins hit over the last 2 quarters. When I look at the cast of characters on the management team, I see a ton of experience at CVT.to not anywhere else. Having said that, they just announced a new manager for a large part of Canadian operations. The CEO pay seems high for a company this size, but with him owning 10% of the company and the share worth 10x his pay, I think interests are aligned. The previous director has been selling shares. It should be noted that he owned almost 14% of the company and still has 5 million shares or about 7% of the shares outstanding. If he continues to sell, it will be a drag on the share price. I continue to hold a small position and await the next few quarters earnings to see if they gain any traction on margins. Anyone is more than welcome to comment if they have thoughts on the name. Just wanted to keep up to date on a few things. I sold AEY last week before they reported numbers. Revenues without the acquisition of Adams Global are still falling. I was hoping that stbility in the housing market would mean stability in AEY’s revenue. I was wrong. Inventory is slowly getting sold through the increase in refurbished revenue. This is a good thing as the amount of inventory was always a concern for me. They are likely to do an acquisition soon as the are net cash. I think the CSCO agreement changes the profitability indefinitely going forward. I overlooked the severity of this. I will keep a close eye on the company and jump back in if I see something I like. To be honest, I am kind of uneasy posting positive updates about companies on the blog. I always feel that as soon as I post something about being correct, something unforeseen will happen. 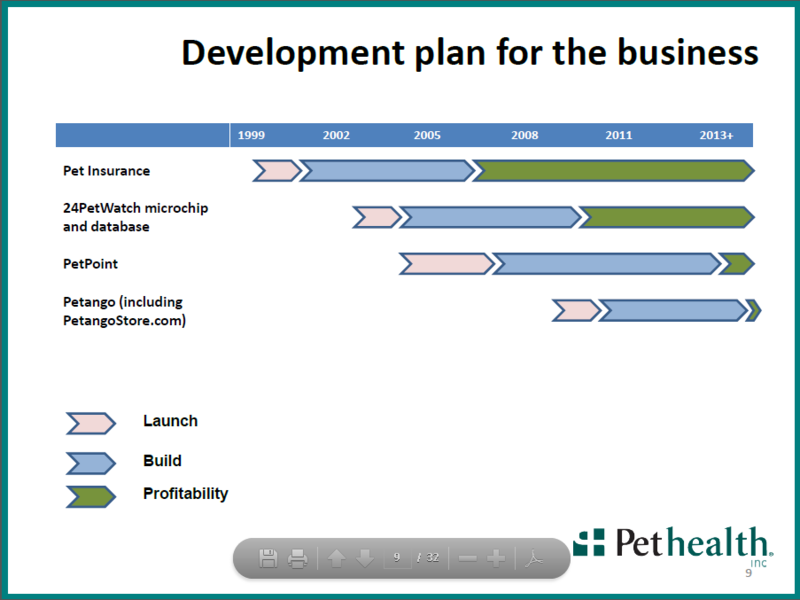 On that note, I will provide an update on Pethealth (PTZ.to). Full year 2011 numbers were reported and everything seems to be on track. The reader should feel free to review my previous post on PTZ. 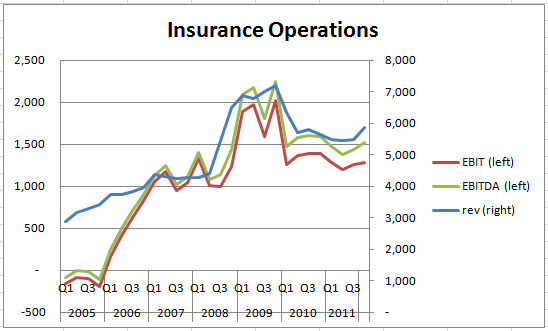 The company finished the year off with relatively strong insurance results. Improved results vs. last year were driven by improved conditions in the UK and restructuring in the US finally showing fruition. I have modelled a run rate EBITDA of 6.5 million. 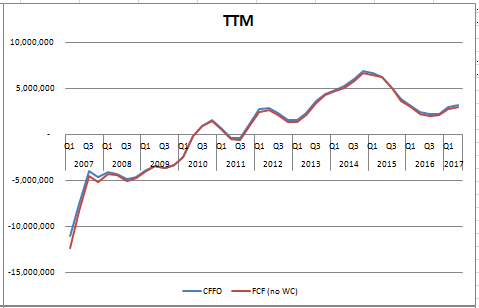 As promised the company has turned EBITDA positive in Q4 2011 (though barely). 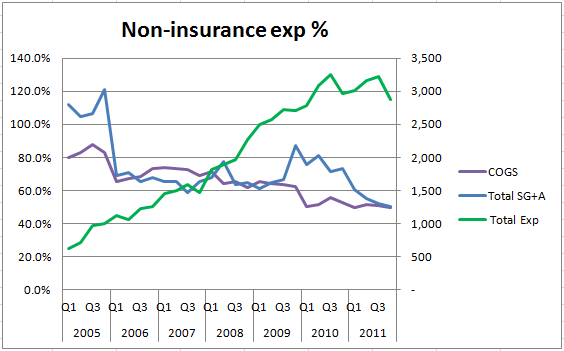 2012 should continue this trend, as ERP expenses wind down and continued traction leads to higher non-insurance revenue. This has been driven by increased revenue coupled with the decline in expenses. The company is executing as promised. Though I am impressed with the results, I hesitate to give too much value to this side of the business. PTZ will be going against some intense competition online. That being said there is a unique company here. They have really done some interesting things with their interactive adoption site. Also the data they collect from the RFID chips could prove to be valuable. They are actually able to have some large customers finance expansion. This is happening now in Petpoint, a management application for animal welfare organizations. I stole this slide from the most recent investor presentation. I put fair value of the insurance of 6x EV/run rate EBITDA and add a conservative value for non-insurance. Last go around I felt that non-insurance had not proved itself and gave it a value of $0. 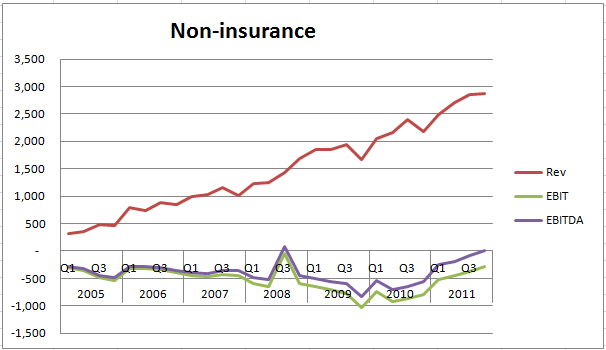 This time I give insurance a value of $1.09/share based on mean reversion and no growth. Non-insurance gets $0.25-0.35/share. Based on revenue multiples with comparative companies and a crude asset value. This gives me a very conservative fair value of $1.35-1.45. I have not sold any of my original shares of PTZ despite the run. Ongoing capital inflows to the portfolio along side a run in other holdings has prevented becoming too overweight PTZ. I will hold on and see what the non-insurance side of the business can produce. Disclosure: The author is long PTZ at time of writing.